EDIT: Here are some tweaks if you install 12.04 (Precise Pangolin). Since I will have to do a fair amount of traveling in the next year I was in need of upgrading my trusted workhorse of Toshiba Qosmio F60 to a more portable option that will be easier on the shoulders during long travels. After doing some research into which of the major manufacturers offer the best support for a Linux based Operating System it came down to a final two: the Intel i7 variants of Samsung Series 9 and the Toshiba Z830. In the end it came down to Toshiba having full-size VGA, HDMI and Ethernet connectors at the rear of the unit (no need for carrying adapters) and getting a very decent price rebate for the Toshiba. The first and only task in the included Windows 7 OS was to create a recovery USB drive using the Toshiba included utility (on the desktop). You need a 12GB USB stick (found out the hard way after buying an 8GB version with the unit on advice of the sales guy). After booting from a USB stick created from the Ubuntu 11.10 ISO (http://www.ubuntu.com/download/ubuntu/download) with Ubuntu Bootdisk Creator (or alternatively UnetBootin) I opted to wipe the whole SSD drive. If you are not sure that you want to stick with Ubuntu it might be safer to try running from USB or dual-boot. Note: you need to use the USB3 connector on the right-hand side of the machine to boot (not the rear USB2 connectors). Press the F-12 Function key when turning the unit off and choose the USB Boot option. The Oneiric Ocelot (11.10) installation was extremely smooth. As predicted by the previous research all the hardware was detected automatically. Even Bluetooth and Toshiba Function keys (screen brightness and display switching) work without any tweaking. I am currently looking into some SSD specific tweaks thanks to this article on ZDNET. I will post future updates on further experiences when it comes to battery-life and other day-2-day issues. 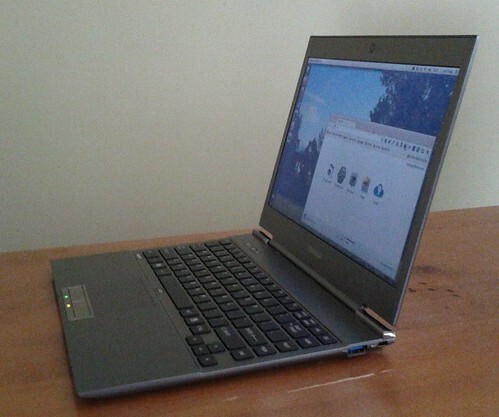 Looks like this unit is definitely a good option for people looking for Ubuntu Notebook / Ultrabook hardware. Well done Toshiba ! Now I just want a refund for the wasted Windows license…. Enjoy your OPEN Ultrabook ! Well – let’s just call it ‘vastly more open’ then. I am a pragmatist on these things. If you’re inclined to follow the purist route it’s probably time for screwdriver and soldering iron (which I quite enjoy – but not for utility computing tasks). Well done. I am about to buy this unit and install Ubuntu on it. Thanks for your post. Is the keyboard backlight working fine on Ubuntu? @tommaso – yes. keyboard backlight is working fine for me. Ubuntu 11.10 – keyboard backlight can’t be operated by fn+z nor any other key for me. How to fix this in Ubuntu? You can just turn it on/off/timer in BIOS, or in Win7, not in linux (I tried several distro’s, Debian included). I wasn’t even aware you could switch keyboard backlight with FN+z. My backlight just comes on when you touch a key and goes off after a few seconds of inactivity. This can be setup in BIOS with a timer value (default is 15 sec). In Win7 after installing ‘value addon package from Toshiba’, you can switch backlit keyboard using fn+z …. but apparently not in linux, the toshiba_acpi module (/proc/acpi/toshiba) does not support that … or does it? works well. after a few weeks of practical use i am still happy with it. How is the battery life running Ubuntu? @brent: The battery life seems reasonable. Under full use with no services disabled I can get around 3+ hours which is massively better than I had with previous units. With some tweaking I am sure you could extend this. I have no comparison on how this compares against Windows battery usage as I have never used it. Just bought the Z830, nice computer :) I immediatly installed Ubuntu 12.04 64bits. All the functions and materials work out of the box. Excepted the pad (de)activation button. I did some optimisations for the SSD (in /etc/fstab), swapped Unity for Gnome+Cairo (with compiz effects activated) = more or less 5 hours battery life. 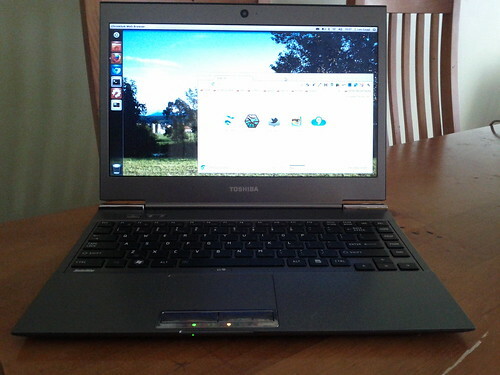 I bought a couple a weeks ago the Z830 and I installed the Ubuntu 12.04 64bits. The only sings that the laptop is still alive are the pulg led (it blinks since the laptop is not branched), the power led (in green) and the internet led (also in green). Any Idea on how to reboot the computer? @Jose: no ideas off the top of my head. leave it on for the battery to die would be the obvious one. @Jose: maybe pluging in a VGA monitor, ethernet and a phone in the USB port can speed up the process ? Also – have you tried to get a terminal screen with CTRL+ALT+F1 ? Ey Jose, any news about your problem ? I’ve recently ordered this model and I’m planning to install ubuntu 12.04 on it after having read reviews about its suitability as everything seems to work well on linux. After 5 months of day-to-day use i haven’t had any of these issues an i haven’t heard of any further ones. Thanks for the review, and thanks everyone for adding your comments! I should also mention I followed the above procedure almost to the letter in my installation too, with the addition of firmware update under Windows. @WarblerBoy: The Firmware upgrade while still on Windows is a very good suggestion ! I did not do this and haven’t got around to do it after (as it is a real pain – like you pointed out). However I have not noticed any fan issues on my particular machine – but I noticed that some blogs were mentioning this. Have you tried Z930? It is supposed to be the follow-up model for Z830 with faster cpu and similar hardware. Is it going to be as easy as turning Z830 in to an ubuntu book? Thanks for answering. Haven’t tried Z930 as yet – the Z830 is behaving well and more than adequate. But seems according to LinLap: http://www.linlap.com/wiki/toshiba+portege+z930 it seems ok. I have a Toshiba Portege Z830-11M, the one with a 3G modem. Anyone had any problems with the driver for the Ericsson modem on Ubuntu/Mint?